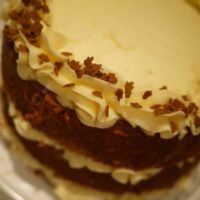 A rich, warmly spiced gingerbread cake recipe from my childhood. This remarkably light and fluffy cake is served with a generous spoonful of warm lemon sauce, the way they did in the village pot luck suppers I used to go to when I was a child. How many Weight Watchers Point is in this recipe? 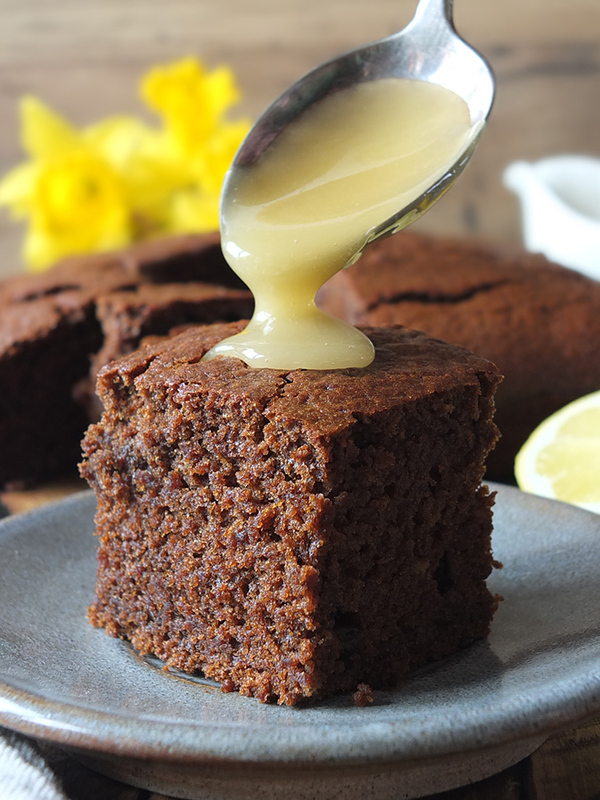 Easy Ginger Cake - Egg and Dairy Free! A mother and daughter are in the kitchen, sunlight streaming through the gingham curtains while blue jays and chickadees chirp outside the window. Chick-a-dee-dee-dee-dee-dee. The scents of rich, sugary molasses and the warmth of ginger and cinnamon waft through the kitchen. Parent and child laugh, cleaning up after a bonding baking session, the child licking the bowl clean while the mother does the washing up. 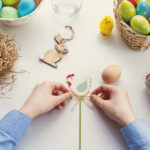 Mothering Sunday – a day of acknowledging and remembering our mothers, to cherish our childhood memories, and be thankful for all that our mothers did bringing us into and up in this world. Giving birth is supposed to be one of the most magical, rewarding experiences a woman can have. 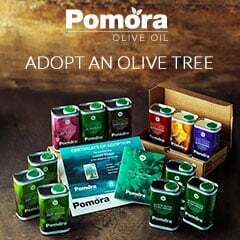 For some, though, loving and nurturing one’s own offspring does not come naturally. Sunlight streamed through the window (was there gingham curtains? I can’t recall), the birds chirped outside and the scents certainly did waft through the kitchen, but the mother-figure is notably absent. She’s sitting alone in a darkened room upstairs crying, or silently angry about something that had happened at some point in the previous 35 years. Grudges were held onto as if one would cease to exist if they were simply let go. The gingerbread cake was made by the child, yes, and presented to the mother as a peace offering in the hopes of gaining the approval of a woman who, despite giving birth to two children, could not show love. “Mum, I love you,” the child would say. “That’s nice,” came the disinterested reply. So the child stopped saying it. I was kicked out of my childhood home at aged 16 when I was legally old enough to be made homeless (I was a difficult child, you must understand). I’ve had to fend for myself since. Mother’s Day always invariably opens these old wounds, the longing for the nurturing childhood I never had. It’s taken a lot of thought and trying to understand things over the years, but I bear no ill will now. We all have our own journeys to make through this short but precious life, and it’s a waste of time to hold onto grudges. I learned a lot from my estranged mother, valuable lessons, intended or not. I learned how to be self-sufficient, and how to use my stubborn-ness to my advantage and I learned how to forgive. I learned how to use a dry spaghetti stick to check if a cake is done or not. Most importantly, through the absence of love, I learned how to love my own children, and to let them know through hugs, kindness and thoughtful gestures as often as I possibly can. I likely shout at them more often than I should, don’t get me wrong, I’m not a perfect parent, but I do try, and my children do know they are loved (I asked the nearly 15-year-old this morning to make sure!). This gingerbread recipe is the first cake recipe I ever recall making. It was one of my firm favourites as a child, but not something I’ve ever made in my adulthood. Well, that’s not completely true – after moving to the UK (where there is a decided lack of Crosby’s molasses!) 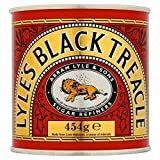 I attempted this recipe using Lyle’s black treacle. Goodness me what a solid black lump it was! Inedible! So the recipe became forgotten in my notebook of handwritten recipes brought over from Canada. Last year I discovered that equal proportions of golden syrup and treacle are a perfect Crosby’s molasses substitute (do check out my old fashioned soft molasses cookies recipe! 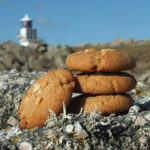 ), and so I decided to try it with this gingerbread recipe. Cream together the butter and sugar. Add the treacle and golden syrup (or Crosby’s molasses) and boiling water. Stir well. Sift over the dry ingredients. Mix until there are no lumps. Pour into a greased and lined 9-inch cake tin and bake for 30-35 minutes. To prepare the lemon sauce, simply combine the sugar, butter and lemon juice in a small saucepan and bring to the boil over a medium-high heat. Turn the heat down and simmer, stirring constantly for five minutes, until the sauce thickens. Remove from heat and add the vanilla. Serve over slices of warm gingerbread cake. Excuse the cracks on the top of the cake – it’s not supposed to look like that. I am still trying to get to grips with my brand new oven It’s a fan oven and I’m still trying to get used to the temperature and timings, given I’ve never owned a fan oven before. I have to say I am loving it though! I honestly don’t know where the original recipe came from, but I’ve included both the original and my UK adapted version for your perusal. 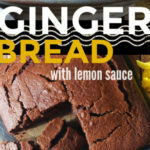 The lemon sauce is something we never had at home, but rather, during village gatherings, pot luck dinners and whatnot, gingerbread with lemon sauce was something usually on the menu. The tart lemon really compliments the rich cake. 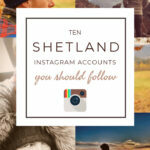 Do try it – it really does work! There are 12 Smart Points per serving of this recipe. 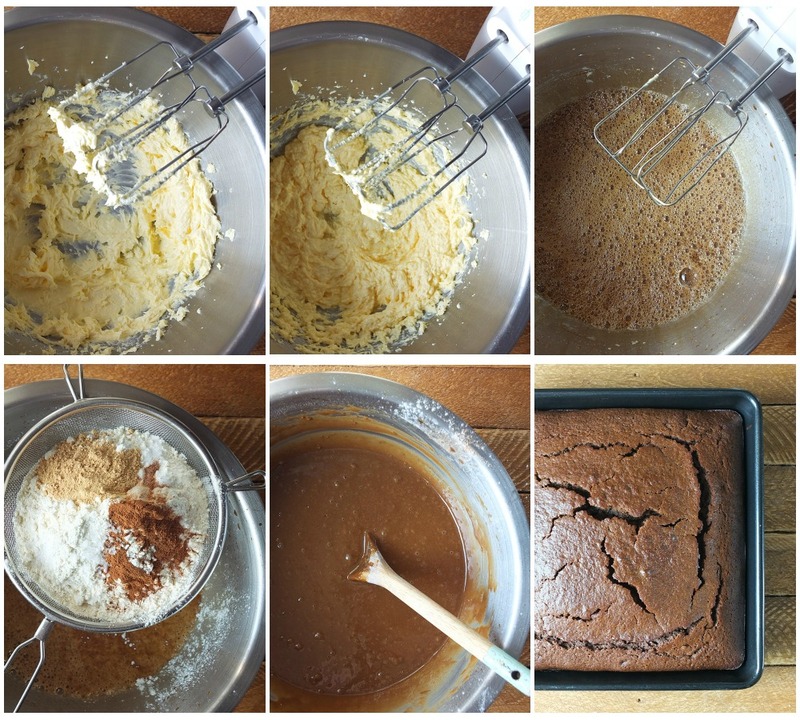 Preheat your oven to 180 °C/ 160 °C fan/ 350 °F and grease and line a 9-inch square cake tin. Beat in the egg until well combined. Add the golden syrup, treacle and boiling water, and stir well. Sift over the plain flour, bicarbonate of soda, salt and ground spices. Stir until well combined (there should be no lumps of flour!). Pour into the prepared cake pan and bake for 30-35 minutes, or until a skewer inserted in the centre comes out clean. To prepare the lemon sauce, combine sugar, butter and lemon juice in a small saucepan and bring to the boil over a medium-high heat. Turn the heat down and simmer, stirring constantly, for five minutes, until the sauce thickens. Remove from heat and add the vanilla. 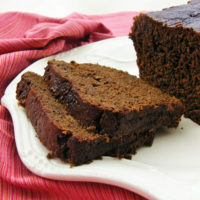 Serve over slices of warm gingerbread cake. Tips for reheating: this cake also tastes delicious cold, but if both the cake and sauce have cooled, spoon a bit of the sauce over a slice of cake and microwave for 15-20 seconds. 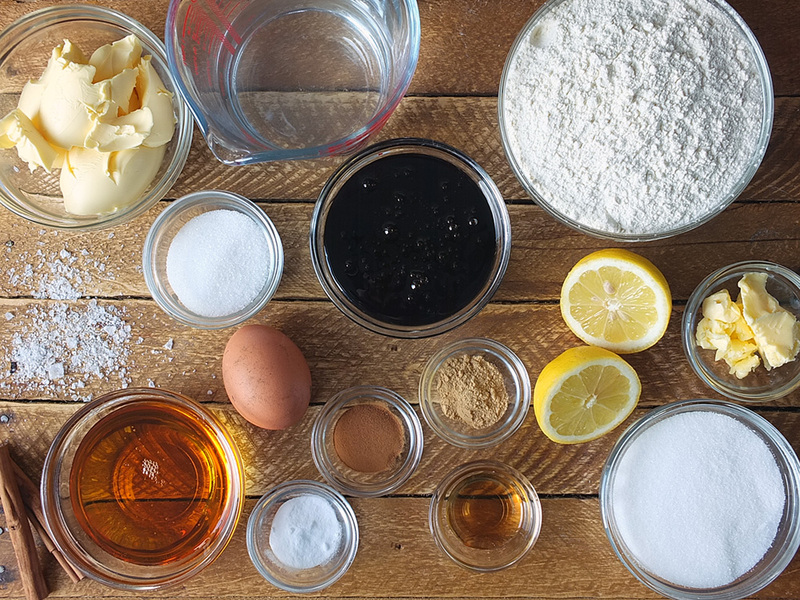 Tips for using Crosby's Molasses: replace the black treacle and golden syrup in this recipe for one cup of Crosby's molasses. Can I replace the butter with shortening? This recipe was originally made with Crisco shortening, but I prefer the taste of butter. Weight Watchers Points in this recipe: there are 12 Smart Points per serving. Tried this recipe?Mention @TangoRaindrop or tag #elizabethskitchendiary! A collection of gingerbread recipes from other bloggers. A beautiful layer cake for those coffee and/or gingerbread fans. 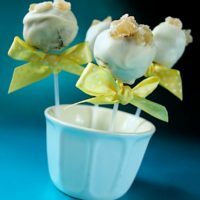 Ginger cake with ginger and cinnamon buttercream coated in white chocolate. 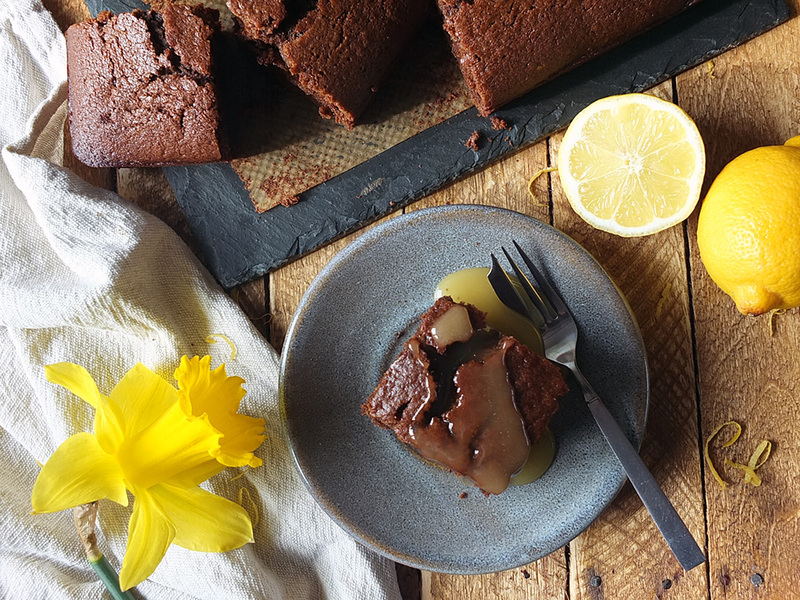 This one step vegan easy ginger cake recipe is sticky & intense as well as being egg free & diary free. « The Ultimate Super Mario Birthday Party! I have had this bookmarked on my laptop for months as it is also my childhood favourite from school. I finally made it and the sponge was perfect, but I managed to make lemon toffee for the sauce! My fault – I forgot to put the sugar in, then added it to boiled butter! Tasted nice, but nearly pulled a filling out! We shall have it again tomorrow with the correctly made sauce. Interesting. 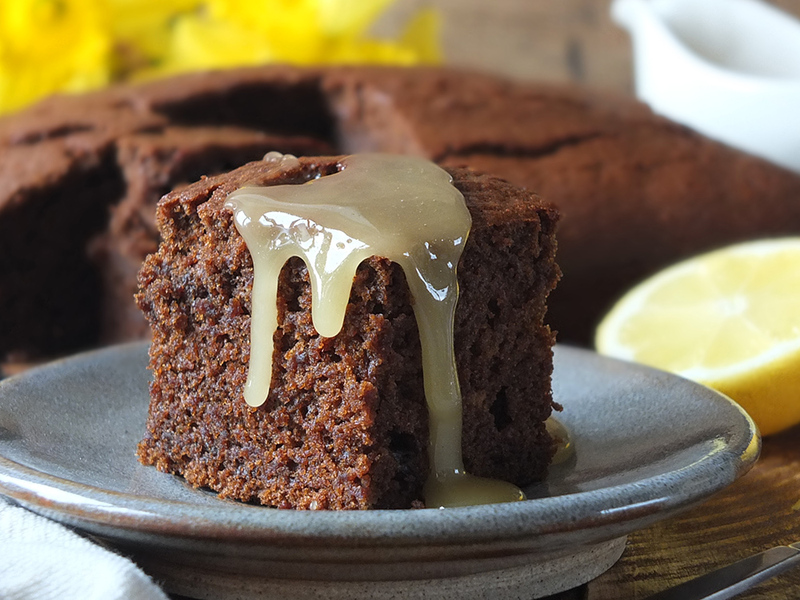 I never would have thought of using lemon sauce on top of gingerbread cake. However, it sounds amazing. I was going to make gingerbread cookies for Christmas. But from your delectable recipe, I’m going to make this instead. Thanks. I love your recipes there seems to b something or everyone,especially in my family. My dad adores ginger, loves it in so many recipes but thus really looks like his perfect cup of tea. Love the lemon sauce with it. What a fantastic idea, a spaghetti stick never used it before but certainly will be now, such a simple idea but love it x x ty again! Having children really makes you think about your own childhood – so sorry to hear yours was tough but it must be a triumph to give your children the love that you never had. 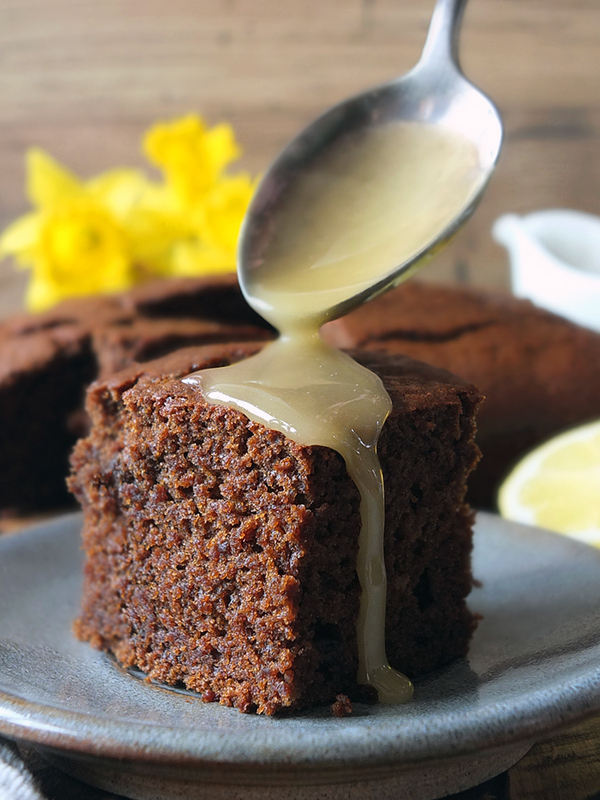 I had some lovely gingerbread cakes in my childhood and I remember some having lemon icing – my mum was a great fan of lemon but I wasn’t – and yet I find the combination makes me nostalgic for a childhood that wasn’t perfect but was full of love. Your gingerbread looks fantastic and if this couldn’t melt a cold heart then perhaps nothing could. That is such a beautiful piece of writing Elizabeth and far from the idyllic Canadian childhood I had imagined you having. Life can be so tough, but it sounds as though you’ve managed to turn things around quite brilliantly. I may not have had a father that wanted me, but I had a mother who did. 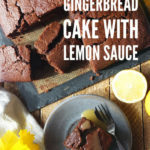 Oh and the cake sounds delicious too – I often make sharp lemon icing to go with gingerbread, but I like the idea of your lemon sauce even better. What a sad story of your childhood, I’m so glad to hear you have children of your own that you love and cherish so much. The cake looks delicious, love the idea of a lemon sauce and what a great tip about the spaghetti stick! A co0mpletely unexpected combination of lemon and ginger, but the more I think about the more it works. Thank you for the inspiration. Your life is such an amazing story in so many aspects. I can’t imagine having a childhood like yours as I was brought up by my mum and my nan in the same house. I still have a notebook of recipes that I took to university with me 20 years ago but my handwriting is not nearly as nice as yours! Thanks for linking up. I love the combination of ginger and lemon. I love gingerbread cake. I must make this. 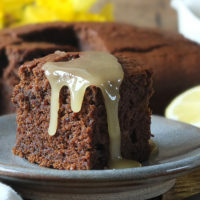 Love gingerbread cake, I bet the sauce contrasts really well. Sounds like you are doing a pretty amazing job, despite history! 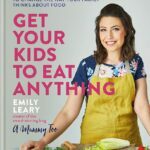 I have never had a great maternal relationship either and I know I am constantly worried that it might get passed on to my daughter….. I try hard to counter the negative learning! 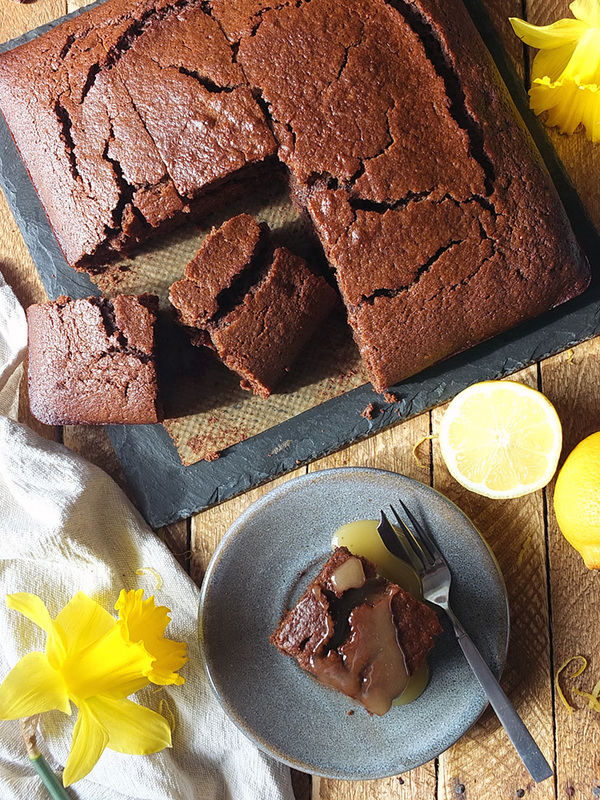 The cake looks amazing… I love the combination of ginger and lemon and whether they are meant to be there or not, the cracks in the cake look perfect! 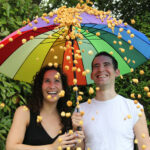 The photos are great too….. 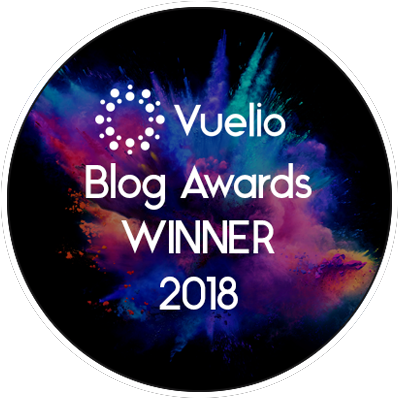 Beautifully written Elizabeth, the imagery is bringing across what you went through and it is so good that in the end you have been able to not only survive but thrive. 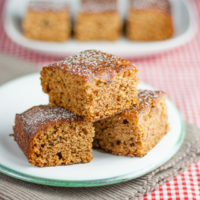 I am a sucker for gingerbread, the lovely warm, spicy sweetness and sticky texture is so delicious. Yum! Nazima Pathan recently posted…Want to know how to make millefeuille? Here is an easy rhubarb and strawberry version! I was lucky enough not to have the tough childhood you had although it wasn’t all a bed of roses. My parents were not demonstrative – I think it’s a generational thing. Like you I try to make sure my own two know they are loved – you do the best you can. The person who gains is you. Really touching story and you are brave to share it. Ginger is my favourite cake flavour and I love the cracks. Mmmm! The lemon sauce would be good on banana cake too. Elizabeth recently posted…The Ultimate Super Mario Bros Birthday Party! Oh wow! These look super duper yummy, and I am craving them right now! One of my absolute favorite types of cake, never had it with lemon sauce before but like that idea a lot! Thanks for sharing your story, it’s great that at least you try to remain fairly positive about it. Your cake looks incredible, but I have no idea how you’d use a spaghetti stick to test it for doneness! Should it come out soft?! Thanks Becca 🙂 Haha, I suppose I should clarify about the spaghetti stick! You use it like a skewer – just poke it in and take it out – if it comes out clean the cake is done! I think it’s great to focus on your relationship with your own children. I hope they will have happier memories to look back on and that this gingercake can be one of them.